Leukin back taewards the Vale o Peshawar, on the Pakistan side o the Khyber Pass. 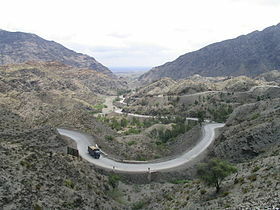 The Khyber Pass (Pashto: د خیبر درہ‎, Urdu: در خیبر‬‎) (elevation: 1,070 m or 3,510 ft) is a moontain pass connectin Afghanistan an Pakistan, cuttin throu the northeastren pairt o the Spin Ghar moontains. This page wis last eeditit on 22 Apryle 2016, at 23:04.